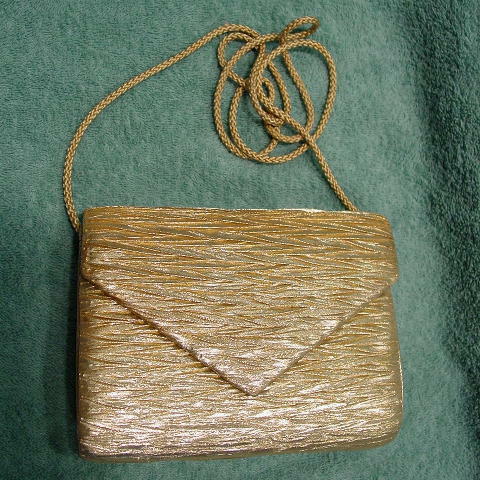 This ruched gold lame fabric purse is by La Regale and was handmade in China. It has an envelope styling with a magnetic snap closure under the lid. It has a 48" long cord shoulder strap which can be tucked inside so you can carry it as a clutch. There is an acetate dark yellow-gold lining with a small open pocket. There is a small light orangish line mark on the bottom side of the side panel. The color is darker and shinier than it appears in the picture. It's more eyecatching in person. A model wore it to an Academy Awards afterparty.